The second Dave Schultz Memorial International of 2017 offers its share of interesting storylines. In the first preview, and in numerous articles before it, we opined that the event stands out due to its usage of the 2018 updated weight classes and the new two-day weigh-in format. Those two variables alone give the tournament some added cache. Everyone it seems — athletes, fans, and coaches — are curious to find out how the procedural changes that are set to roll out in just a few months translate on the mat. Imagine if they were also testing the proposed amendments to ordered par terre at this thing? It might be hysterics. Although the weights and weigh-ins are being highlighted as this Schultz’s biggest selling points, the actual level of participation is another boon. A good number of familiar US Greco-Roman competitors are lacing them up for this one, and with them is a substantial collection of foreign athletes, mostly from Korea. Really, the only conceivable downer leading into tomorrow is the fact that four of the eight U23 World Team members won’t be competing, but with the World Championships just a few weeks away and an overseas trip ahead of that, it’s certainly understandable. 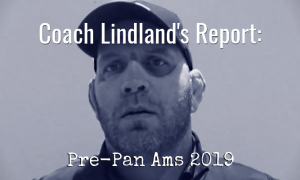 What’s most important is that the revamped Schultz is the first “true” Senior Greco event of the season in this country and we all better enjoy it now, because the next one isn’t coming around for quite awhile. Just about every weight class at the Dave Schultz Memorial this time around features a Korean headliner, or so it seems, anyway. For 77 kilos, that man is Kim Hyeon-Woo (KOR, world no. 1), the hard-charging World and Olympic champ who is still going strong entering the new season. Kim was a pretty sizable favorite to make the podium in Paris until a loss to old pal Tamas Lorincz (HUN, world no. 6) stopped him short. You know what you’re getting with Kim — a hectic pace, brutal pummel, arm throw attempts, and the occasional big throw. 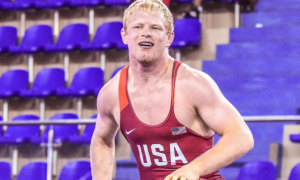 U23 World Team member Jesse Porter (NYAC/OTS) is tentatively listed and if he’s on board, don’t expect him to dial it down just because the biggest tournament of his life is coming up. Porter lives for this kind of stuff. Two of Porter’s OTS teammates are also (apparently) up at 77 — Anthonie Linares and Colin Schubert. Linares legitimately established himself stateside prior to this year, but Schubert had been more of a raw project. That has all changed, as the Wisconsinite should now be thought of as a very real problem for most everyone he faces. Both wrestlers placed fourth at the Senior Trials in April, and then both finished second at the University Nationals in June. Minnesota Storm gunslinger Alec Ortiz should definitely be in the running, as well. There isn’t another “Greco guy” in the country who consistently winds up in barnburners as much as he does. People come to see points and that’s what Ortiz is all about. He is someone who needs as many chances against foreign opponents as he can get, his style meshes more with theirs. Back at his usual weight (or at least the same neighborhood) is 2017 World Team Trials runner-up John Stefanowicz (Marines), who recently competed at 85 for the CISM World Military Games. Stefanowicz came on awfully strong during the spring when he nearly upset Zurabi Datunashvili (GEO) at the Hungarian Grand Prix, and then he did upset Geordan Speiller (Florida Jets) in the semis of the Trials. Datunashvili might not be here, but another tough Georgian is, and that’s 2014 Golden Grand Prix champ Giorgi Tsirekidze. It’s not a lock that Tsirekidze is automatically the man to beat here, but he is absolutely going to be a person of interest for the others in this bracket. The real star of this weight isn’t Tsirekidze or even Stefanowicz. Instead, it’s the wrestler who turned back Stefanowicz in the Trials finals, two-time World Team member Cheney Haight. It is currently up in the air as to how many of these events Haight has left, what his overall status is, etc. He was wrestling very well against Laszlo Szabo (HUN) at the Worlds in August when it all got away from him. This may or may not be Haight’s last dance, so take in as much of this as you can. Multi-time National Team member Courtney Myers (Army/WCAP), one of the hardest dudes on the planet, will also be involved in the proceedings, as per usual. Myers was injured most of 2016 and his career was temporarily in doubt. With that no longer the case, he has turned it up a notch and should be expected to be in the argument somewhere by the end of the day tomorrow. Two-time World Team member Patrick “Lone Wolf” Martinez (NYAC) and 2016 US National Champion Kevin Radford (Sunkist) return to competition for the first time since the World Team Trials, where they finished fifth/sixth with Martinez holding the edge. They’re both here, like some others, to give the new format a test spin. After the tournament wraps up, Martinez and Radford will be heading off to Belarus for the Oleg Karavaev tournament and a training camp. But before that happens, there is work for them to do, and it comes in the form of several athletes who are more than capable of showing up on the medal stand Thursday night. One of them — naturally — is Jon Anderson (Army/WCAP), who put forth what might have been his most impressive effort to date at the aforementioned Trials. Anderson was on temporary duty throughout the spring and had to piece together his training camp. He then went out, in the deepest bracket of the entire tournament, and placed a hard third to make the US National Team for the seventh time. 2016 US Open runner-up Khymba Johnson (NYAC/OTS) pounded out the competition at the Eduardo Campbell Cup a few weeks ago, so he’ll be ready to go. 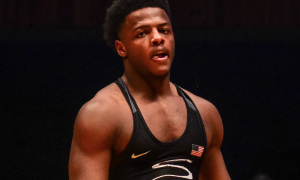 Johnson placed third at February’s Schultz after a semifinal loss to Radford, who had also defeated him in the National finals last December. U23 Trials runner-up Rich Carlson (Minnesota Storm), who although is still gaining Senior experience, possesses all of the tools necessary to become a top contender down the road, so keep an eye out for him, as well. 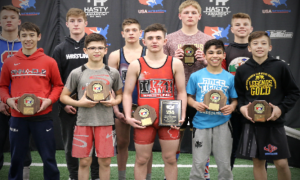 Dual-style National Team member Hayden Zillmer (Minnesota Storm) is the lead US dog in this bracket, and for good reason. 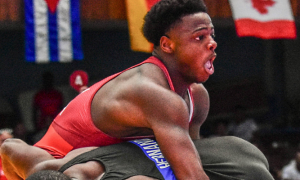 He was a close runner-up to 2016 Junior World bronze medalist G’Angelo Hancock (Sunkist) at every domestic event last season, which was also his first full year of Senior competition. In addition, Zillmer earned two overseas medals, first a silver at the Herman Kare in January, and then a bronze at the Ljubomir Ivanovic Gedza International in July. He’s not only big and strong, but he is also a workhorse who seemingly never tires. He’s a nightmare. But that doesn’t mean he won’t have his work cut out for him. He will. 2010 Junior World silver/2012 Olympian Lee Se-Yeol (KOR) is up a weight and coming off of a period of inactivity. That won’t matter much. As an 85’er, Lee wasn’t a monster by any stretch, but he still demonstrated big-time power from par terre top. Whether or not that comes into play for him in this event, it’s something to pay attention to nonetheless. Zach Merrill (NYAC) was a decent heavyweight who could move a bit, but he’s much better-suited for 98 (97 for the sticklers). He’s just so sound and difficult to knock off his spot. Merrill is also coming off of a tournament win at the University Nationals, where he defeated Hancock in an unusual caution-filled final. But he did score offensive points in the process, and that’s important. For Merrill to be effective, he can’t play the pummel game, nor does he seem to want to. He is a wrestler who needs to create motion because that’s how he does his damage. Austin Schafer (NYRTC) had just begun training Greco when he decided to enter the World Team Trials, and boy, did he make an impression. Yeah, some folkstyle scrambling helped him and that kind of thing won’t fly as well against foreign opponents, but the general outline is there. Schafer also snared a fifth at the University Nationals, for what it’s worth. But he has now had a few months of full-time training and while that isn’t enough to expect him to surge past more experienced foes on a regular basis, it might be enough to provide him with the requisite firepower to help him contend at this event. 2011 Junior World bronze medalist Toby Erickson (Army/WCAP) won his first Senior National title in 2016 and seemed poised to potentially unseat longstanding king of the US heavies, multi-time World Team member Robby Smith (NYAC). That was the narrative, and he did appear to have closed the gap. But at the end of the day, he’s still waiting. What shouldn’t be lost in any of this is Erickson’s ability. He’s a terrifically talented wrestler who is just now beginning to enter prime years, and that could spell trouble for the rest of these beasts. Erickson’s WCAP teammate Jacob Mitchell isn’t that far behind, however. Mitchell was Erickson’s runner-up at the Open, but he started making waves before that. He comes from a collegiate background and initially flirted with both international styles before choosing Greco. Mitchell has great balance for a big man and delivers brute force to pummel his way out of any problems. Erickson isn’t the only former Junior World bronze in the bracket, as Korea’s Kim Min-Seok is back in the US for another November rendezvous. Last year, Kim defeated Marine Eric Fader in the finals of the Bill Farrell. 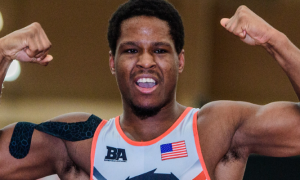 Malcolm “Thunder Struck” Allen (Minnesota Storm) had zero — zero — Greco experience entering 2016 and finished third at the US Nationals behind Erickson and Mitchell. Six weeks later, Allen defeated two international opponents to win February’s Schultz, and then he placed fifth at the World Team Trials. The style just makes sense to some athletes and Allen seems to come from that mold. Year 2 for Allen kicks off tomorrow and for a weight class that could use some punch, his presence is welcomed. 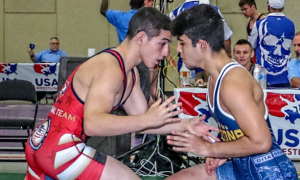 10:00am-1:00pm — Greco-Roman prelims through Consolation Round 1. 5:00pm-7:00pm — Greco-Roman semifinals, Consolation Round 2. Live streaming available on Flowrestling.org.